Eating beets raw is the best thing. They are sweet, crisp and earthy. I love amazingly saturated colours so the cool beet red really makes me smile. Grouped with bright green mint and clear white goats cheese, it always looks amazing on the table. You’ll never want to cook a beetroot again. Grated raw beet is also amazing in chocolate cake (trust me), on burgers and sandwiches (just ask any Australian) and in dips. It’s sweetness makes it very versatile. I nix the oil in the dressing for this as I like the sharp clean taste the vinegar alone gives the beetroot. Peel and coarsely grate the beets. 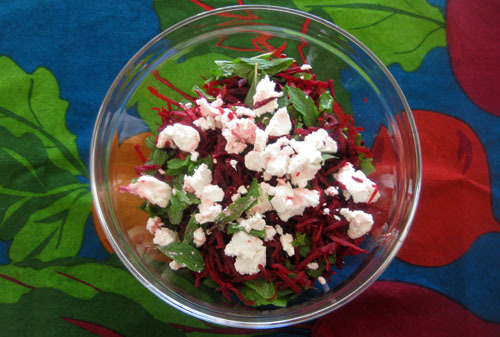 Just before serving, combine the grated beet with the mint, vinegar and salt. Toss and crumble some goats cheese on top. Taste and add more acid or salt to your taste. Serve as a side to anything Mediterranean. It also goes equally well with anything subcontinentally spicy. If you’re eating it as a meal, add some walnuts for protein and you’re set. Hey thanks for the blog.